Pick a Card Game, Any Card Game. 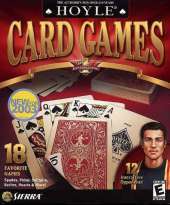 Only Hoyle gives you 18 of your favorite games - whether you're a card shark or a novice. With the great games, fun characters, and accuracy that the Hoyle name guarantees, it's easy to see why Hoyle Card Games is number one. Features: Bridge - Can't find a fourth for Bridge? No problem. The Hoyle cast of animated characters is always ready to play; Canasta; Crazy Eights - Crisp, clear graphics make it easy to follow suit in Crazy Eights; Cribbage is one of four games you can play with friends and family on the same computer. And now play with friends around the world via the Internet; Euchre; Gin Rummy: Discover all the ways to customize your game. Gin Rummy or Oklahoma Gin, internediate or advanced; Go Fish - Great for Kids. Kids favorite like Memory Match, Go Fish and Old Maid have never been this much fun. Hearts - Up to four people can play on one PC, or fill in the gaps with animated opponents; Memory Match; Old Maid; Pinochle; Pitch; Poker - Hoyle card games is a snap to setup and install; Solitaire; Spades; War; Skat; Tarot. Features: Challenge the Hoyle cast of 12 animated characters, each with adjustable skill levels and attitudes; Create personalized characters with Facemaker. Choose your hairstyle, outfit and facial features - the possibilities are endless; Rules, hints and tips are just a mouse clip away; Choose the music, skill level and game variations; Play with up to four people on the same computer; Easy to Install and start playing right away; Free Internet Play; Free Hoyle Rulebook and strategy guide; Great for Kids - Children's favorites like Go Fish, Old Maid and Memory Match have never been more fun.